Every man has poetry within him. Poetry is the awareness of the mind to the universe. It embraces everything in the world'... It is a universal force and like God it can never be discovered, although it will always be present directing thought'... Poetry is a descent to the roots of life. The manner in which, sometimes, a rank outsider, a maverick figure, arrives from nowhere and becomes a leavening agent affecting the cultural life of a people, always takes me by surprise. 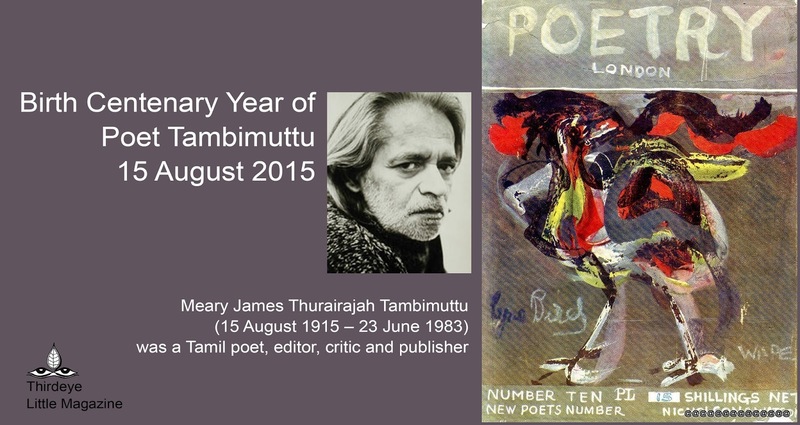 When a colleague in San Diego last year mentioned the name of Tambimuttu as a person who had left a deep imprint on her mind, I dipped into my own memories and came up with a vague recollection of the name because a poem of this Srilankan man was included in our ‘syllabus’ for English literature at college. But not much more than that I could come up with. Till, of course, intrigued, I started reading up. And the more I read, the more fascinated I became with this unusual life. Tambimuttu’s name – his full name was much longer – was a mouthful, "a maternal sound, like a prayer to a forgotten Indo-European mother goddess", as someone described it. Linked by ancestry to an old aristocratic family from Jaffna, nephew on the one side of Gnana Prakasar, great Jesuit lexicographer, and on the other to the celebrated indologist and art-historian, Ananda Coomaraswamy, this young man, barely twentythree years of age, arrived in London in 1938. Apparently, however, he came as no ordinary tourist or visitor, but as one armed with ideas and ambitions about starting a poetry journal there. One can imagine the insecurity, but also the daring of it all: a young Asian, virtually unknown to anyone, member of a subject nation, alien to the literary field in London, hoping to impact the literary and artistic scene in an unfamiliar and somewhat supercilious land? He could, initially, sense a natural hostility. There was some jeering, and some sniping, but Tambimuttu rode all that, and launched together with a friend, his magazine. Poetry London is how it was christened. And guess who all contributed to the very first issue? Some of the most renowned names in those parts: Dylan Thomas, Stephen Spender, Herbert Read, Lawrence Durrell. Suddenly, there was a stir in literary circles. Other great names started appearing in the magazine: T.S. Eliot, Iris Murdock, Kathleen Raine, Sacheverell Sitwell. The year of the launch was the same in which the second World War began. What is astonishing at the same time is how many artists – apart from writers and poets – Tambimuttu was able to associate with his enterprise. Some of the biggest names in the world of art in England painted covers for Tambi’s journal, illustrated poems, provided decorative tailpieces: Henry Moore, Graham Sutherland, Barbara Hepworth, Ceri Richards, Lucien Freud. The list kept growing, all on a shoestring budget. And one begins to wonder what was it about Tambi that drew people towards him? His lithe and handsome appearance? Fascination for a man from the mysterious Orient? Openness of manner? The warmth with which he came across? The sheer passion for poetry which he felt, and others sensed in him? Perhaps a bit of all of these. But, whatever it was, one is struck with the enormous affection in which he came to be held by so many people from so many different fields. Consider this passage from Timothy Leary: "In the twenty-three years since our first meeting, every time I think of Tambimuttu a light glows in my brain and I smile and feel a little better. And everytime our paths intersected, the glow would increase and my smile break into a happy laugh of welcome." There were those who saw him as a transmitter of ancient wisdom and beauty. To continue with Leary: "Perhaps he was not an entity of this time and place. There was this mystery about Tambimuttu, that Merlin sense about him that transformed an ordinary situation into something a bit magical, raised us up a level or two on the splendour dial." But clearly Tambi was no grave, looming figure, by no means cast in the Guru mould. He was a bohemian at heart, and there are stories about his drinking parties, his hand-to-mouth living, slovenly quarters, bouts of frustration and anger. But always one ends up reading how utterly disarming he could be: this man who had become within a few short years a highly regarded poet, critic, editor, publisher. The press that Tambi helped launch was called the Lyrebird Press, and it is wonderful to see him insistently persuading different painters to paint the lyrebird for his covers. The lyrebird is a native of Australia; the male of the species has a lustrous plumage, brilliant to behold, dazzling in its colours, which he raises like a lyre or harp in the mating season. In natural ways it reminds one of our own peacock, except that it is much smaller in size, and has a quality that the peacock does not possess: it can imitate the cries of all manner of birds, causing great confusion but also great merriment. Perhaps Tambi liked the bird so much because he was a little like one himself: light of touch, possessed of seductive plumage, capable of speaking in many tongues at the same time. What’s left/ of a life - / old bones/ underground/ or burned away/ to a lingering scent/ brief embers/ of ashes, turned/ to faint shadows - /smoke bruising/ then leaving/ the afternoon air./ What’s left?/ The blank/blue page/ of your passing. A Sri Lankan Tamil from an affluent English-speaking Roman Catholic family, M. J. Tambimuttu arrived in Britain at the age of 22. Having already published three volumes of poetry in Ceylon, he soon immersed himself in the literary world of London’s Soho and Fitzrovia. Within little more than a year of his arrival he had founded the magazine Poetry London (1939–51) with the writer and musician Anthony Dickins. While Dickins' involvement quickly diminished, Tambimuttu edited the first fourteen volumes of the magazine and a number of books, as well as writing his own poetry. In July 1943, with the backing of publishers Nicholson and Watson (on the recommendation of T. S. Eliot who was an admirer of his), he established Editions Poetry London, which published contemporary verse and prose, as well as art books, in hard cover. Tambimuttu was also a regular participant in the BBC radio series Talking to India during the Second World War. A man of charisma as well as a talented editor, he had an array of friends and acquaintances with whom he enjoyed the pubs and cafes of Fitzrovia. 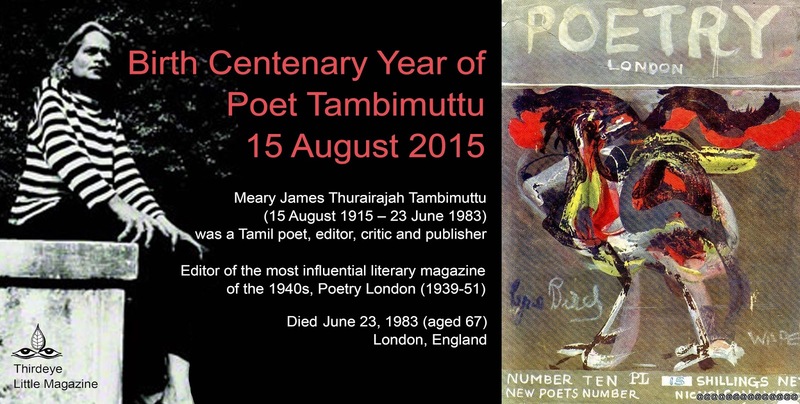 Tambimuttu returned to Sri Lanka in 1949 then moved to New York in 1952 where he launched the magazine Poetry London–New York (1956–60) as well as continuing to publish short fiction and poetry of his own, and lecturing at the Poetry Center and New York University. In 1968 he returned to London where he founded a final magazine, Poetry London/Apple Magazine, which had just two issues, and a publishing company, the Lyrebird Press. He died of heart failure in London in 1983. These lines from an elegy I wrote for a close friend of mine who passed away last year were perhaps the last poem Chelva Kanaganayakam translated from Tamil to English. After reading and translating the poem Chelva was so deeply moved and read it out toThiru, his beloved wife. Then he called me in the middle of the night to share my grief. I was inconsolable. Even though I was somewhat used to the dreaded midnight or early morning phone calls from SriLanka over the past several years of war and devastation, I was completely unprepared for the grim email message from Chelva’s brother-in-law late last night. After attending the official function inducting him as a Fellow of the Royal Society of Canada in Québec City on November 22, 2014, Chelva suffered a cardiac arrest and passedaway. A great man o fkindness, wisdom and intellectual rigor is no more. Chelva Kanaganyakam, received his bachelor’s degree in English Language and Literatureat the University of Peradeniya in Sri Lanka and his doctoral degree at the Universityof British Columbia. After his doctoral studies he joined the University ofToronto’s Department of English and became professor of English. He was the director of the Centre for SouthAsian Studies at the Munk School of Global affairs. His research andteaching interests were post- colonial studies, as well as diasporic writings and translations. While the geographic focus of his research revolved around South Asia and South East Asia, Chelva was always attracted to “hybridity andhierarchy” of literatures in English and in the vernacular languages of these regions and the diaspora. He would often pose the question whether one should have some grasp of a vernacular language rather than, or in addition to, French,German or Spanish in order to undertake serious research? “The centrality of the literary text” he would argue, “cannot be erased although the frame could be one that includes but goes beyond a Eurocentric one.” In his constant search for alternative ways of configuring the field of postcolonial studies, Chelva was prolific in writing and publishing. In the study of literary history Chelva was keenly interested inventuring into new methodologies. Another theme that animated his current workis the notion of aesthetics in Tamil writings that emerged as a response and resistance to war, loss, genocide and trauma. Through his translations and accompanying critical reviews, Chleva was grappling with the question of how notions of aestheics and poetics as articulated by modern writers of resistance in theTamil context can challenge traditional ideals and formulations of aesthetics. Chelva was an excellent translator of fiction and poetry from Tamil to English, his translation of Nedunalvaadai- a classical Sangam Tamil epic - is a great work of finesse, beauty and painstaking detail. Indeed, Chelva translated almost all of the great contemporary Tamil writers from Sri Lanka. Chelva was one of the founding members of the annual Toronto Tamilstudies conference at the University of Toronto since 2006. The conference isthe largest international Tamil Studies conference in North America. 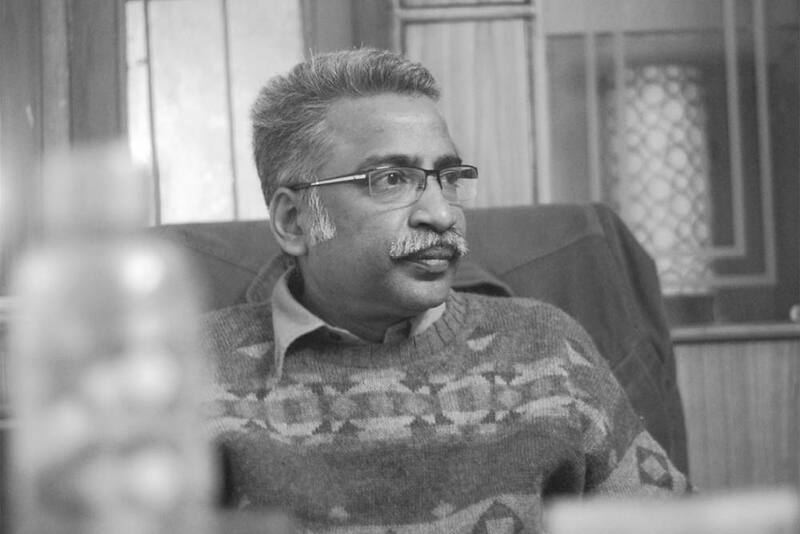 Some of his other key works include: In our Translated World: Global Tamil Poetry (2013),Nedunalvaadai (in Tamil, 2010), Wilting Laughter: ThreeTamil Poets (2009), You Cannot TurnAway (2010),Counterrealism andIndo-Anglian Fiction (2002); Ed. Lutesongand Lament: Tamil Writing from Sri Lanka (2001); Dark Antonyms and Paradise: The Poetry of Rienzi Crusz (1997); Configurations of Exile: South Asian Writersand Their World (1995);Structures ofNegation: The Writings of Zulfikar Ghose (1993). A few months ago Chelva completed compiling, translating and editing a grand volume of Tamil literature since 1948 titled Uprooting the Pumpkin for Oxford University Press. He spent hundreds of sleepless nights working on this volume and it is so painful that hewas unable to see the volume in print. At the time of his death Chelva was working on a massive volume on thehistory of South Asian literatures in English. It is so unfortunate that thisproject as well as his other translation projects will not be completed by him. Chelva’s students, friends and colleagues will always remember hiswarm, welcoming but slightly hidden smile and open heart, the heart that suddenly failed him, and us too. South Asian people's movements (women, youth, peasants, labour, socially marginalised groups) and civil society organisations have planned a convergence from 22 to 24 November 2014 in the form of People's SAARC or people's assembly, parallel to the 18th SAARC Summit in Kathmandu, Nepal. The overarching theme will be ‘People’s Movements Uniting South Asia for Deepening Democracy, Social Justice & Peace’. The people of South Asia are coming together at People’s SAARC 2014 challenging systematic marginalisation of people, groups, communal division and fragmentation and degradation of environment and impact of climate change through widespread voicing of ideas and experiences and by forging solidarity across the borders. Thus the theme of this year’s People’s SAARC Convergence is focused on People’s Movements Uniting South Asia for Deepening Democracy, Social Justice & Peace. In this context we are planning to have side events on ‘Universal Social Security’, ‘Sexuality, Exclusion and Resistance in the South Asian Context’ and ‘Conflict led challenges and way towards sustainable peace for women of South Asia: Discussing women’s ESCRs’. People’s SAARC while challenging systematic marginalization of groups, it is important to acknowledge the concerns of the South Asian women that has not achieved much attention at national, regional and international economic growth policies and development agendas. To take these issues forward it was felt that side events should be organized with widest possible participation from all. Concept note is attached for more detailed information on the same. Generosity. That’s the first word that came to mind when I thought about how to write this difficult reminisce on Pandian’s passing away. Though I had been aware of his many essays in the EPW and had read “The Image Trap” by then, I met Pandian only in the early 1990s when I walked into his office at the MIDS in Adayar. Dressed casually in his bush-shirt and slacks, the thin and boyish guy with a scraggly mustache was a bit hard to square with the mental image I had of him. I was just beginning my research into India’s intervention into Sri Lanka and Pandian opened up a world of possibilities for me. He suggested names and phone numbers of people I should meet; groups in Chennai and elsewhere that I was unaware of; and books and articles to read. His interest in my research – and we met regularly almost every summer thereafter while also exchanging many emails – was deep and genuine. Most importantly, he helped me think otherwise than the nation. His take on Dravidian politics; on the alleged peripheries – both regional and intellectual- of the heartland and the mainstream; on the multiple and varied idioms of resistance to majoritarianism; on the ways in which support for the Sri Lankan Tamil cause in Tamil Nadu was something that could not be adequately understood or calibrated through just the formal domain of politics; and a host of other issues enriched and complicated my thinking in all sorts of ineffable ways. Looking back, what is striking was his patience with me. Especially at the beginning, I had unconsciously and completely ingested a very mainstream and Delhi-centric narrative of India’s intervention into Sri Lanka. Helping me see that, and in a wider sense to “rescue history from the nation,” was something Pandian did almost imperceptibly and as a consequence of our equitable conversations. Most importantly, all our interactions and arguments were marked by his generosity towards and affection for what I was doing. The students and others you met at Pandian’s office in MIDS were different from the ones you might run into at the offices of most of India’s intellectuals. Very often they were more comfortable in Tamil or in regional languages rather than English, and were not part of that comfortable upper-caste/middle-class/English-educated habitus that dominates our academy. Pandian interacted with them no differently than with the twice-born, whether domestic or NRI or authentically firangi. The outpouring of remembered generosity by a wide diversity of his students from various places – MIDS, JNU, Manoa and elsewhere – is the real testament to his innate egalitarianism and collegiality. And of his respect for interesting ideas and people, irrespective of their provenance in terms of class, accent, language, or caste. As shown by his contrarian stance on the cartoon controversy, by his daring resignation from MIDS to become an academic libero for a while in the early 2000s, and his refusal to accept certain regions, cultures, civilizations or individuals as somehow more consequential than others, Pandian hewed to an ethic that came from both within and elsewhere. His was a distinctive voice, and a rare one in the context of India. In these biopolitical times marked by an obsessive and commodified care for the self, Pandian indulged his love for cigarettes, alcohol and the good life in full measure. I am trying very hard not to channel my frustration with his early passing into wishing he had played more by the rules. For Pandian was never about playing by the rules but more about playing with them, as he himself might have said with that delighted gleam in his eye. Sankaran Krishna is Professor of Political Science, University of Hawaii at Manoa. He has written extensively on ethnic identity and conflict and identity politics in India and Sri Lanka. Prof. Krishna is the author of Postcolonial Insecurities: India, Sri Lanka and the Question of Nationhood, Minneapolis: University of Minnesota Press, 1999. (New Delhi: Oxford University Press, 2000) and Globalization and Postcolonialism: Hegemony and Resistance in the 21st Century, Lanham, MD: Rowman and Littlefield, 2009.